In a new video, former Apple marketing vice president Allison Johnson talked about marketing at Apple and what it was like to work under Steve Jobs. 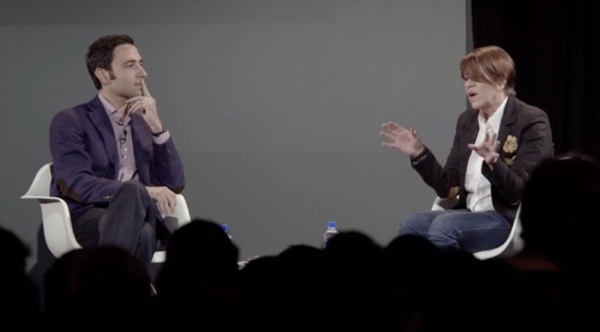 The interview, which took place at the 99U Pop-Up School last September (via Cult of Mac), covers words that were verboten at Apple -- "brand" and "marketing" among them -- as well as anecdotes about Steve Jobs, and some advice on marketing. Johnson gave one example from the launch of the iPhone on AT&T in 2007. The carrier had written an email explaining to its internal sales team on how to properly sell the iPhone. Jobs asked to see the email and edited the email so the iPhone would be positioned correctly. "He would dive in at a level of detail that most human beings would never consider," Johnson explained. "So, a CEO looking at a sales memo to an internal sales group at AT&T. He cared that much." Johnson goes on to explain that Apple's product and marketing teams work closely together from early on in the design process. As a result, the Product Marketing team "understood deeply what was important about the product, what the team's motivations were on the product, what they hoped that product would achieve, what role they wanted it to play in people's lives". Because of this, Apple's marketing was greatly improved and on-target. For external marketing and PR agencies that aren't involved as deeply in the development process, Johnson said, it's more difficult for them to position products well. After Johnson left Apple, she founded West, a creative agency that works with tech companies like Anki and Jawbone. When there was negativity in the press about antennagate, I think it was born out of a perceived arrogance on Apple's part. They made a phone with an external antenna, and that could easily be perceived as frivolous or vain. In 2013 in the early days of the iPhone 5, media hatred was high. Even Wozniak said publicly that Apple was arrogant by not increasing screen size more. And there was a lot of talk about a "lack of innovation" at Apple (which I think also had to do with size). The stock price suffered. Recently, it seems opinions of Apple are high again, for a couple reasons- rumors of new products on the way, and because I think most people have come to understand that the iphone as a "whole is greater than the sum of it's parts." In other words, people are finally realizing that android's ecosystem flaws, weight heavily against whatever pricing, or size advantages it has. So the future is looking good for Apple, and their ethos of "product first" etc. has been validated. If you watched through, you would have seen Allison talk about Steve Jobs and the problem with the iPhone 4. Steve Jobs sobbed because of it... hope everyone that uses that against Apple feels bad. You made a grown - now passed - man cry! Be yourself. She was sincere about that. Liked her perspective that "marketing" is too often just a "filter word" for selling or pitching something that doesn't offer real value. I'm not saying you do; i'm saying you grossly overestimate your capabilities, and it's a very common trait.